Because of its complicated steps and the time it takes to be cooked, souffle pancake is not an easy dish one can re-create at home. But thankfully, quite a few cafes in Korea offer the dish, reinterpreted with their selections of toppings. Innisfree is a cosmetic company of Korea popular for its cute packages and affordable price range. Innisfree’s flagship store in Pangyo has a cafe on its second floor, where you can find healthy and pretty food. 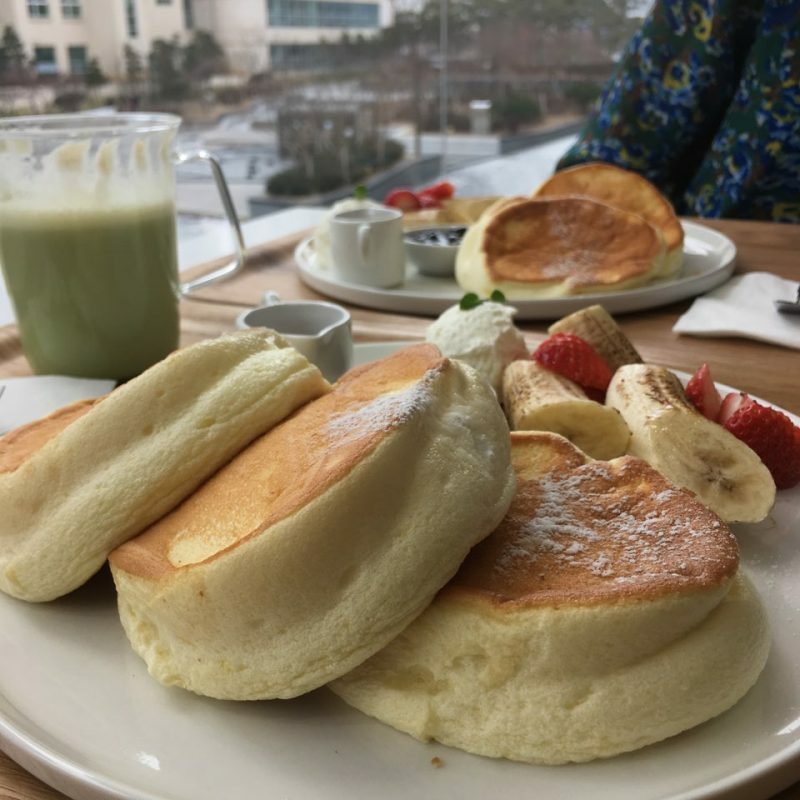 Surprisingly, Innisfree is one of the very first to bring soufflé pancakes to Korea. Because of that, the store is always crowded with people and minimum of an hour of wait is required no matter what time you visit. However, once you take a bite of the pancake, annoyance about the wait vanishes at once. Served with whipped cream, syrup, blueberry compote, and grilled fruits, Innisfree’s souffle pancake is a must-try if you want to try how the original tastes like. Newly opened pancake house in Hongdae, Paulin is known for its pancakes that are sweet enough to be desserts. Toppings used at Paulin are not limited to fruits like berries, bananas, and mangoes. For those who want extra sweetness, they came up with earl grey and tiramisu pancakes. The sweet pancakes here taste like something in between pancake and cake. Sarr, located in the trendsetting Yeonnam-dong neighborhood, takes dessert pancakes to another level. Their signature Green Pancake is served with gooey green tea cream flowing down the stack of pancakes. Thanks to the cream, the pancake literally melts in your mouth, going beyond being fluffy. You can add more creaminess and moist by eating with green tea ice cream served on the side.